Tarte Cosmetics sure has been busy getting us ready for summer! We SO appreciate it! Another day, another awesome release! 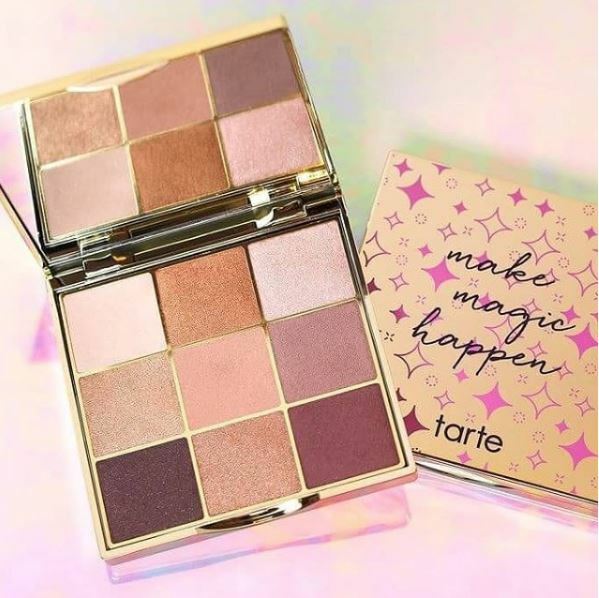 This time its an addition to their Double Duty Beauty line – introducing their NEW Make Magic Happen Eyeshadow Palette releasing Thursday, 6.01 (on the same day as their Radiance Drops)!! We already know this color scheme is speaking to you, am I right?! The palette features 9 warm & cool shades & will retail for $32. The formula sounds soon dope – it’s a liquid to powder formula! What whaaaaat?! Sounds incredible! Plus, we love all of the rosey hues, peachy tones & light, shimmery shades! You clearly won’t be able to get too deep or smokey of a look from this palette, but we TOTALLY okay with that. We love this just the way it is! Don’t forget – the Double Duty Beauty line is exclusive to Ulta (isn’t like, everything these days?! We’re not mad about it though) so it won’t be available anywhere else! Who else is obsessed with these shades?! Those colours are super pretty!